Channel spend grows post Cyber Five as retailers eye late-season shoppers and increase their mobile focus. With the holiday season in full swing, Google Shopping spend saw steady year-over-year growth in December. This sustained spending pattern, along with increased mobile spend, showed retailers’ efforts to engage with last-minute holiday shoppers searching for deals in nearby brick-and-mortar stores. For the complete breakdown of the 2018 holiday season, consult our pre-Cyber Five and Cyber Five-specific articles. 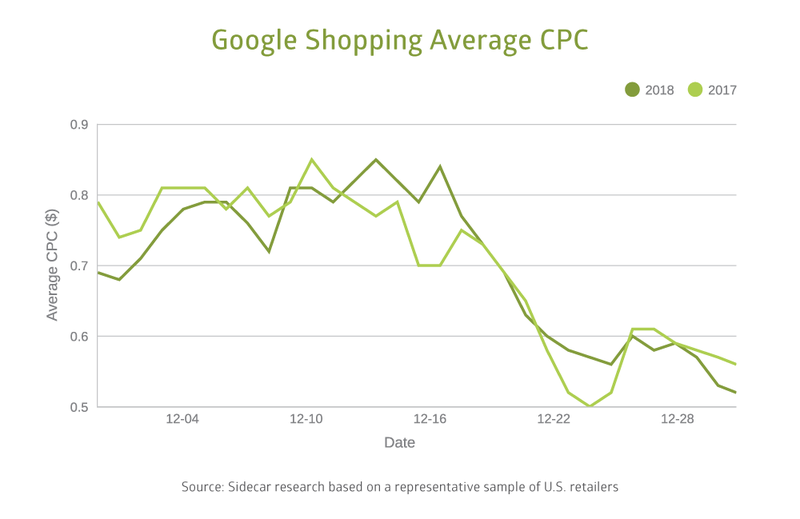 Sidecar took a representative sample of U.S. retailers and analyzed their Google Ads accounts from December 1-31, 2018, and compared performance to the same period in 2017. Note: these early findings will be updated with final numbers in our upcoming 2019 Benchmarks Report, coming in March 2019. In the third and final installment of our Holiday Data series, we looked at how retailers performed in Google’s paid search and shopping channels across the month of December. 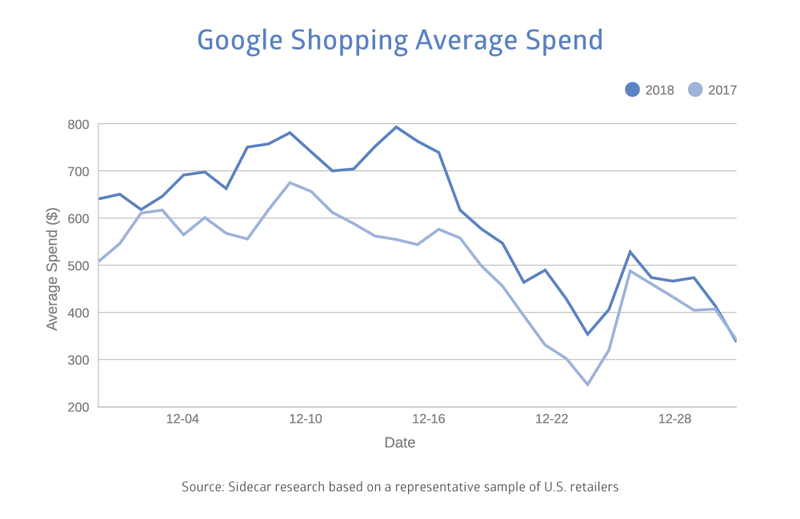 Retailers in Google Shopping didn’t spend nearly as much in December compared to November, but there was a significant uptick in year-over-year daily spend. Average daily spend in December increased 20% in 2018 and was higher nearly every day of the month compared to 2017. Average spend in 2018 peaked on December 15, five days later than in 2017, indicating retailers made a stronger push to catch late shoppers in the final days before Christmas. Due to some of the growing adoption of data-driven attribution and other attribution models that credit clicks and conversions earlier in the purchase cycle, we expected most retailers to invest heavily in early December and scale back as the month went on. Instead, we saw the opposite: average CPC was highest in mid December and saw the largest year-over-year increase between December 14 and 17. A similar trend took shape during Cyber Five. We believed retailers would invest heavily in the white space days of Saturday and Sunday. Instead, they doubled down on spend during Black Friday and Cyber Monday, revealing that we’ve yet to reach a saturation point for the two hyperactive holiday shopping days. We expected most retailers to invest heavily in early December and scale back as the month went on. Instead, we saw the opposite. Google Shopping is becoming the channel of choice for finding last-minute shoppers. Retailer ad spend between Dec. 21 and 25 was up 36% year over year, more than double the amount over the first three weeks of the month. Retailers with 1-2 day shipping, local inventory ads, and buy online, pick up in-store options are at an advantage of catching more shoppers later in the holiday season. 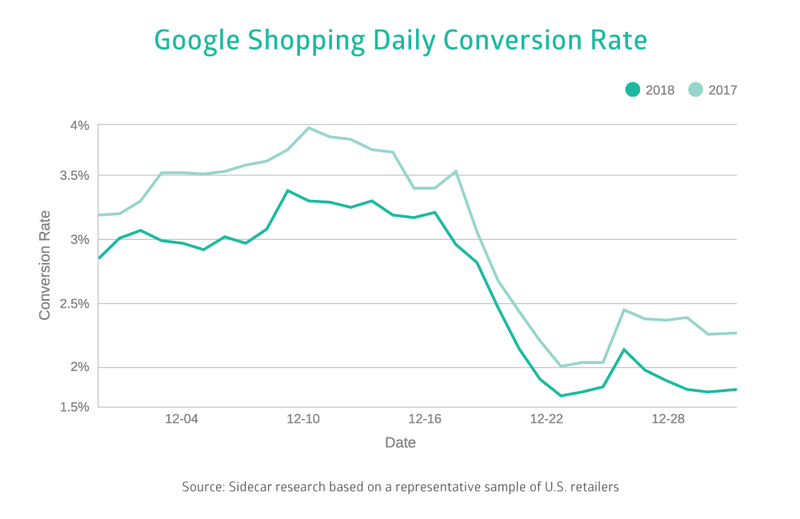 Despite an increase in conversions, conversion rate in Google Shopping dropped 13% in December 2018 compared to December 2017. This trend speaks to the growing number of options, channels, and platforms shoppers have at their disposal when researching and buying products. It is also indicative of the number of ads displayed on Google Shopping. 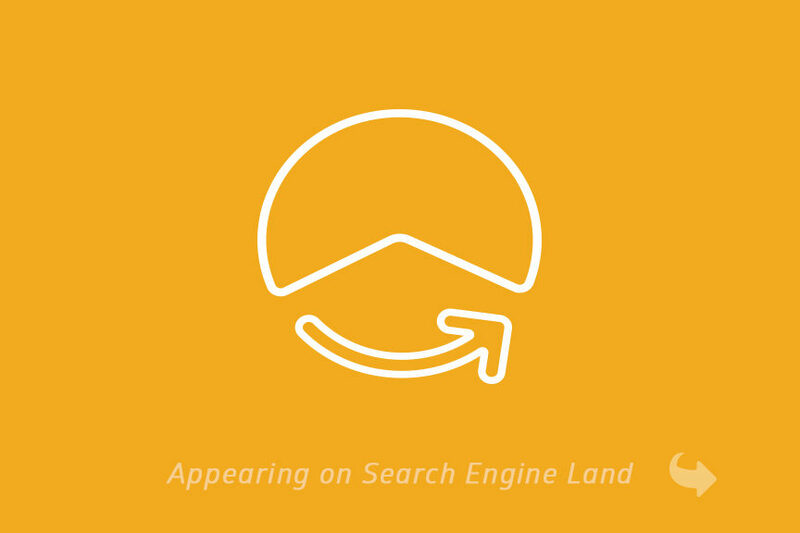 Because Google displays several ads per search, buyers understand how many choices they have and are clicking on more ads before making a purchase. Much like in 2017, mobile growth dominated the 2018 holiday season. Mobile was the majority device retailers invested Shopping spend in throughout November, and December was no exception. Mobile accounted for 52% of Google Shopping spend in the month, the highest share of spend for mobile across our holiday data analysis. 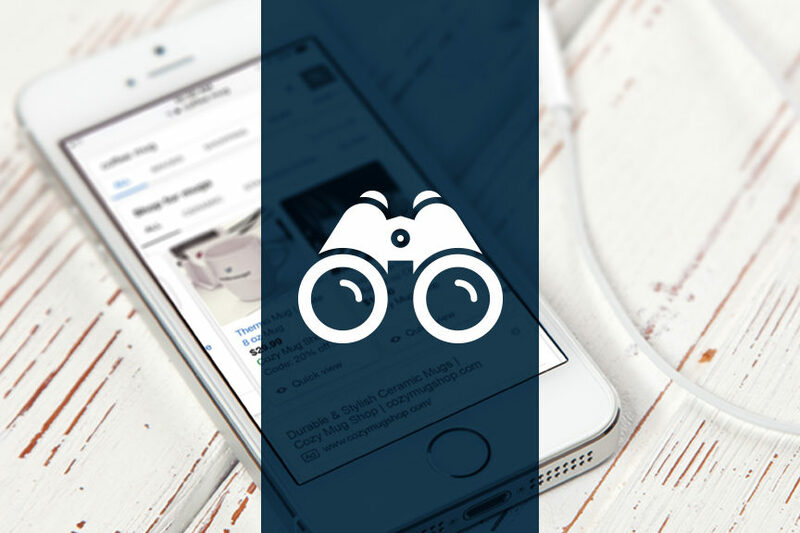 The message is clear: optimizing for mobile will be a must for retailers in 2019. Shopper engagement on mobile was prevalent throughout the month. 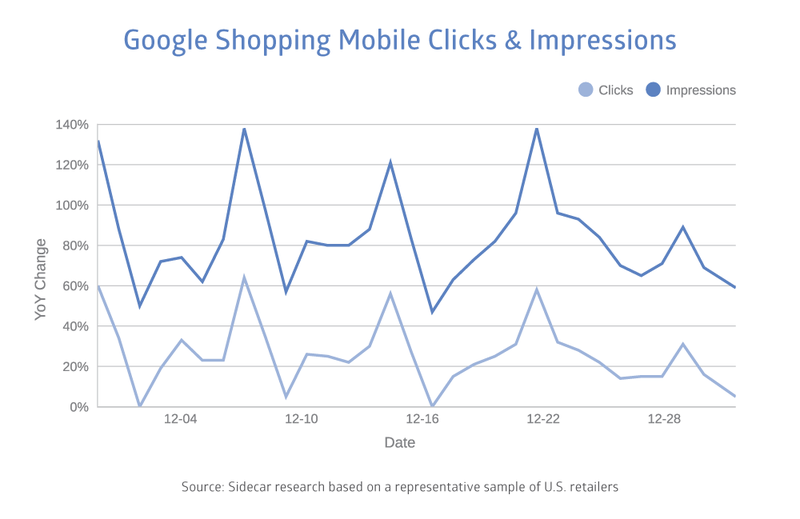 Google Shopping year-over-year clicks on mobile in December rose 25% and saw steady growth over the final two weeks of the month. No day in December saw a decrease in clicks compared to December 2017. With more retailers investing in mobile (as seen above), impressions on the device skyrocketed 82% year over year in 2018. While some growth was present, desktop performance didn’t fare as well as mobile. 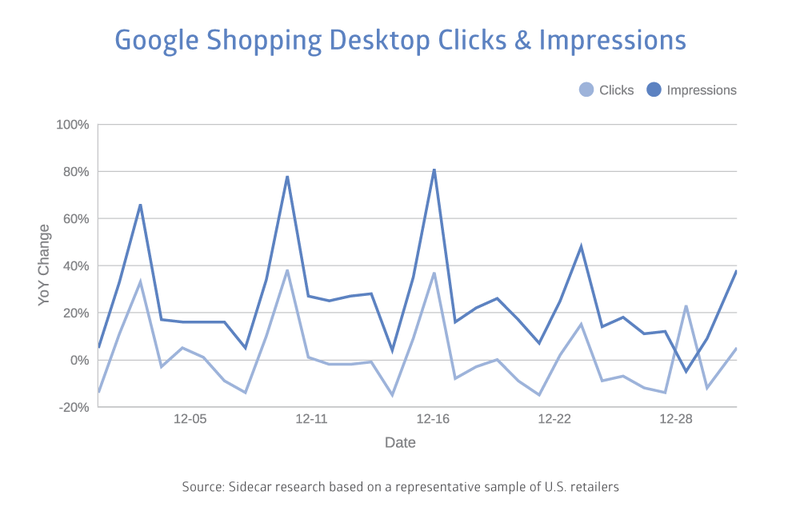 Desktop clicks in December remained unchanged, dropping 1% year over year while impressions grew 24%. 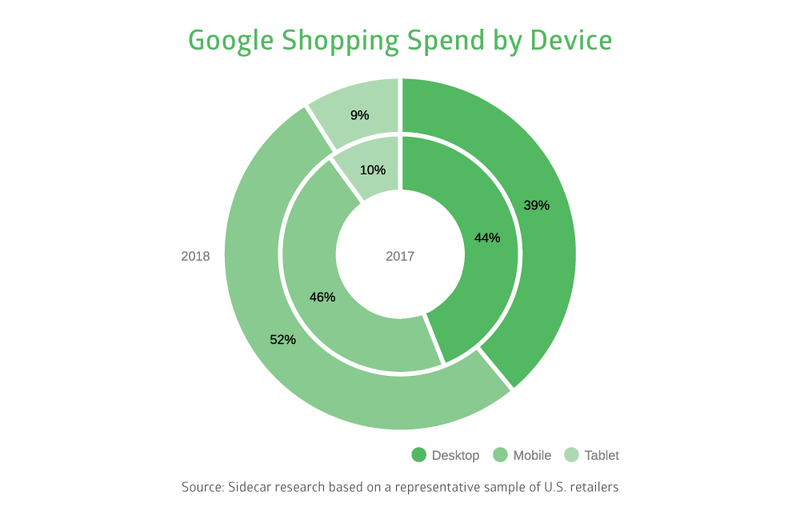 Retailers will continue moving away from desktop and investing in their mobile strategy as shoppers become more comfortable researching and purchasing on mobile. Want more Google Shopping analysis? 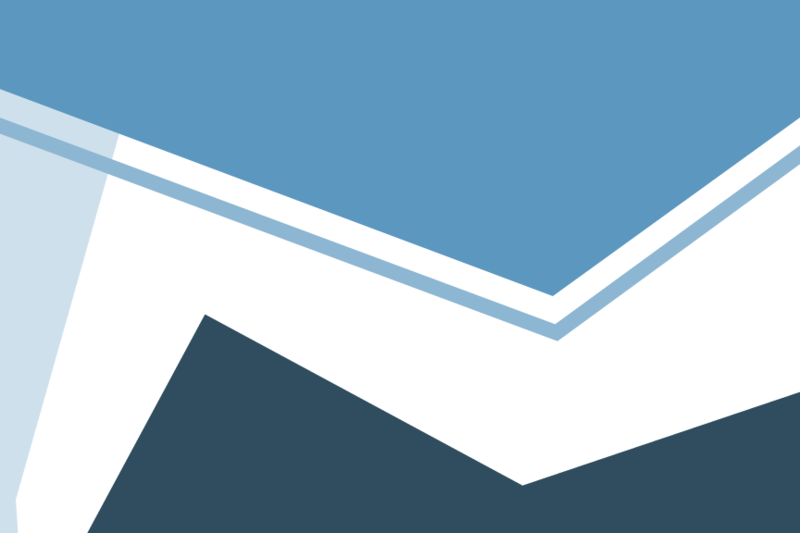 Sign up here and receive updates for our forthcoming 2019 Benchmarks Report, releasing in March. 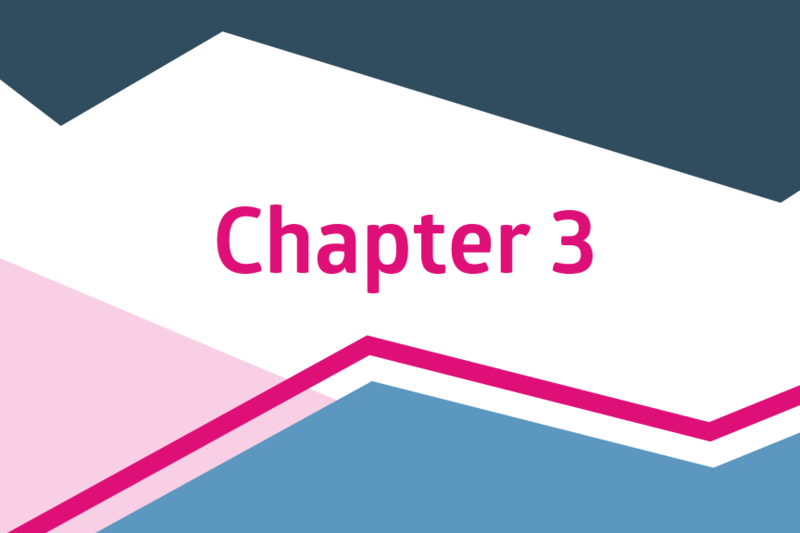 Previous Keeping Up With Google: What Is Target CPA?